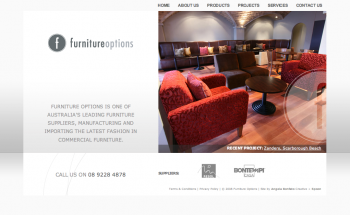 Furniture Options provides retail furniture to the public and wholesale furniture to interior designers and property developers. They approached us to develop an online catalogue, newsletter and a private section for wholesale clients only. Some of the features on the site include the ability to relate projects to certain products, and group individual products to show related items. The newsletter also allows Furniture Options to include any site content in their monthly newsletters.